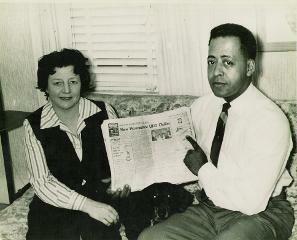 On September 19, 1961, Betty and Barney Hill were relaxed and enjoying their bright starlit drive along US Route 3, Northern New Hampshire’s major north-south route. From the top of Mount Washington, visibility was 130 miles and the waxing gibbous moon was about two thirds full. It was the last leg of their journey home to New Hampshire’s seacoast after a brief vacation in Niagara Falls, NY, and Montreal, Canada. South of Lancaster, Betty’s interest was aroused by what she at first thought was a falling star, until it suddenly paused in the southwest sky and inched its way upward, stopping next to the moon. As Betty watched the star-like object, it grew larger. South of Twin Mountain, she and Barney stopped at a roadside picnic area in order to walk their dog. This gave her the opportunity to view the object through binoculars. Betty watched as it traveled across the face of the moon flashing multi-colored lights. By the time she handed the binoculars to Barney, the object had changed course, and shortly thereafter, rapidly descended in their direction. Back in the car, Betty was awestruck by the perplexing object that seemed to be pacing them. Barney made a second stop near the Old Man of the Mountain, in Franconia Notch, to observe the ever descending silent craft. It rapidly changed direction, ascended and descended vertically and hovered motionless in the sky. This enigmatic phenomenon piqued Barney's interest and confounded his sensibility. His skepticism left no room for the nonsensical belief in flying saucers. However, although he remained cool for Betty's sake, he was quietly ruminating about the remarkable sight. He knew that it was different than anything he had ever seen before. As they motored south of the Indian Head area of North Lincoln, almost directly in their path, the couple encountered a huge flattened circular disc with a row of intense blue-white lighted windows along its forward edge. Barney rapidly brought the car to a halt in the middle of the road and grabbed his binoculars for a closer look, opening the car door for a less encumbered view. The silent hovering object descended to an estimated eighty to a hundred feet above their vehicle. Rapidly, in an arc like movement, it shifted from its location directly ahead, and rested above the tree tops in an adjacent field. Barney pocketed his handgun and walked toward it. The silent enigmatic craft was huge; maybe sixty to eighty feet in diameter. As he approached it, two red lights at the end of fin-like structures parted from the sides of the craft, and it tilted toward Barney. Lifting his binoculars to his eyes, he spied a group of figures that were "somehow not human" moving about with the precision of German officers. As the craft tilted downward and began to descend toward him, one of these strange creatures, who remained at the window, communicated a frightening message. Barney had the immediate impression that he was in danger of being plucked from the field. Overcome with fear and with all of the courage that he could muster, he tore the binoculars from his eyes and raced back to the car. Breathless, trembling, and in near hysterics, he told Betty that they needed to get out of there or they were going to be captured. As Barney rapidly accelerated down the highway in an attempt to escape from the craft, it shifted directly overhead. Suddenly, rhythmic "buzzing" tones seemed to bounce off the trunk of their vehicle and they sensed a penetrating vibration. They drove on without speaking until 35 miles down the road, once again they heard a second series of buzzing sounds. Vague memories of encountering a roadblock, of seeing a huge fiery red-orange orb resting upon the ground, and feeling a desire for human contact preoccupied their thoughts. They looked for an open restaurant to no avail, so they drove on through Concord, picked up Route 4 and made a beeline to Portsmouth, expecting to arrive at approximately 3:00 A.M. The Hills were surprised to notice that, as they crossed into Portsmouth, dawn was already streaking the sky. The Hills were startled to find shiny concentric circles on their car's trunk. When a compass was placed over the spots, the needle would whirl. But when it was moved to another area on the vehicle, the needle dropped down. Their watches had stopped and never ran again. The leather binocular strap had been severed. Betty's favorite dress had been in fine shape when she dressed on the morning of September 19. But when she returned home, there was a 2' tear at the top of her zipper. The lining was torn from waist to hemline. And the hem was torn down on one side. Later, she discovered that it was coated with a strange pink powder that had degraded the fabric and reduced it to a rag. It has been analyzed by five laboratories. No one can explain the mystery. The tops of Barney's best dress shoes were scraped. He had to purchase new shoes. His pant legs were covered with vegetative matter. Later, a concentric circle of wart-like growths appeared on his groin. They were removed when they became inflamed during his hypnosis sessions with Dr. Benjamin SImon. They were not venereal warts. The day after the sighting, Betty phoned the 100th Bomb Wing SAC at Pease Air Force Base in neighboring Newington, New Hampshire to report an unidentified flying object. 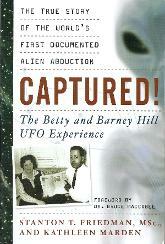 She and Barney gave the interviewing officer a general description of the craft they observed. Barney omitted his observation of the humanoid figures fearing that he might be thought a “crackpot.” Later that day, Major Paul W. Henderson phoned the Hills and questioned both of them extensively. According to Betty, he seemed very interested in the wing-like structures that telescoped out from each side of the pancake shaped craft and the red lights on their tips. As an “ADDITIONAL ITEM”, Major Henderson included information about a radar observation at 2:14 AM. Although it was not possible to determine any relationship between the two observations, as the radar observation provided no description, time and distance between the events, he stated, could hint of a possible relationship. On September 26, after reading a book she found at the public library, Betty typed a letter to Major Donald Keyhoe, director of the civilian UFO group, NICAP, in which she described the encounter. She stated that Barney had observed figures dressed in black, shiny uniforms looking down at him as he stood in a field. They were scurrying about as though they were making some hurried type of preparation. Barney had returned to the car in a hysterical condition, laughing and repeating that they were going to capture the Hills. She mentioned that they were considering the possibility of contacting “a competent psychiatrist who uses hypnotism” to assist Barney in removing the mental block that prevented him from recalling whatever he saw in the field that caused him to panic and develop a mental block. On October 21, 1961, NICAP investigator, Walter Webb, initiated his confidential preliminary investigation at the Hills’ home, interviewing them together and separately for a six-hour period. They had conscious recall for the close encounter with a large, silent hovering disk and the two sets of code-like buzzing sounds that seemed to strike the trunk of their vehicle. Barney described the figures he observed in detail remarking that they were "somehow not human." NICAP members Robert Hohmann and CD Jackson, along with Major James MacDonald (retired A.F. Intelligence officer), interviewed the Hills on November 25, 1961. On this day, the Hills realized that their drive that should have taken approximately four hours to complete had taken seven. They were previously aware that they arrived home later than they had anticipated. But they had no mundane explanation for the 2-3 hour time discrepancy. Their only "lost time" memories were of a fiery orb in the road silhouetted against a stand of trees, a sharp unplanned turn off the main highway, and a roadblock, without knowing where or when it occurred. On March 12, 1962, Betty contacted Dr. Patrick Quirk, a psychiatrist from Georgetown, MA, to request an appointment. Dr. Quirk did not attempt hypnosis. He recommended that the Hills should wait to see if more conscious memories of the experience would emerge. Betty and Barney were beginning to remember information that they had previously forgotten and Dr. Quirk explained that, in time, they would remember more without the use of hypnosis. In 1963, Barney developed a physically debilitating condition, which forced him take a three month leave of absence from his job at the U.S. Post Office. His traditional medical treatment was augmented by psychotherapy, but his health did not improve. At one appointment, Barney mentioned his continuing anxiety over his apparent amnesia and requested a referral to a competent psychiatrist who used hypnosis. His psychotherapist, Dr. Stevens agreed to set up an appointment with neuro-psychiatrist Dr. Benjamin Simon whose outstanding career included expertise in the use of deep trance hypnosis. Early in 1964, the Hills began what would amount to six months of separate hypnotic regression and therapy sessions (hypno-analysis), with Dr. Simon, who knew almost nothing about UFOs, and according to the NICAP investigator's report, refused to read any of the UFO sighting reports he gave to him. He induced amnesia at the end of each session for two reasons: 1. to protect the Hills from remembering their traumatic memories 2. to prevent the Hills from discussing their memories until he had completed his hypnosis sessions. An uncannily consistent dual recall of alien abduction emerged that was somewhat inconsistent with the details of Betty’s dream account. Were it not for a violation of confidentiality, all of this would have remained undisclosed. 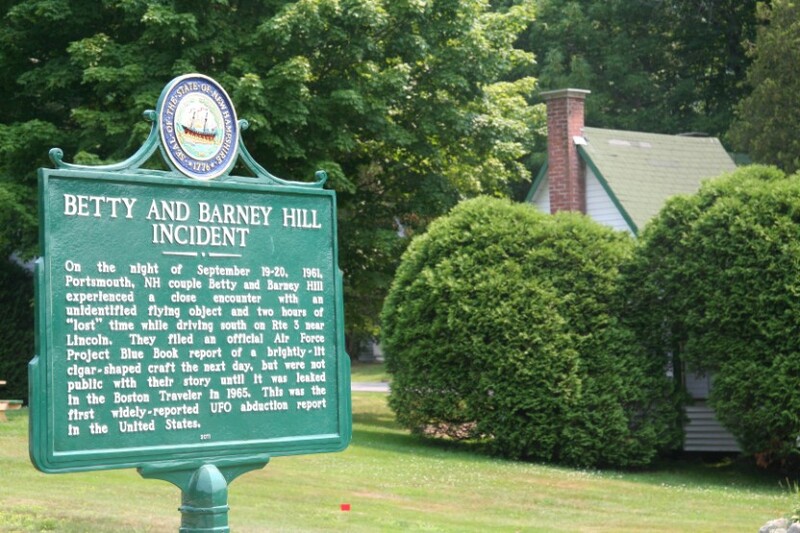 However, on October 25, 1965, the Hills’ greatest fear was realized when a Boston newspaper published, for five days, a detailed account of the Hills’ UFO encounter and abduction experience. On Route 3 in North Lincoln, NH. Look for the Indian Head Resort.